You know how you can watch a movie and just know how it’s going to end? There were some seasons in women’s college basketball where you could do the same. This is not one of those seasons. North Carolina State (21-1) stood alone as the only undefeated team through Feb. 3 until North Carolina ended the streak. It’s the first time since 2014 there has been a battle for the top spot in the rankings traditionally dominated by the University of Connecticut. We’ve had two different teams at the No. 1 spot in the AP poll: Notre Dame and UConn. That counts as a major shakeup for the rankings. Per the AP’s Doug Feinberg, only five teams have been No. 1 since the 2008 preseason poll. Football has had 14 and men’s hoops 21. Preseason No.1 Notre Dame fell to UConn 89-71 at the Jimmy V Classic, losing the top spot in the polls. Then, UConn lost at Baylor. That was the Huskies’ first regular-season loss since 2014 — a streak of 126 consecutive games. Notre Dame had a deciding win over Louisville — resulting in the Cardinals no longer being undefeated for the season. That win over Louisville helped Notre Dame continue on its way to a 12-game winning streak. But then — Notre Dame lost to UNC. Louisville kept the upsets rolling with a win over UConn. N.C. State came in at No. 7 in the Jan. 28 AP poll. That continued an upward trend under coach Wes Moore, who led the Wolfpack to the NCAA tournament in 2017 and 2018 and in 2013-14, his first season in Raleigh. Let’s look at how North Carolina State got to its 21 consecutive wins before the Tar Heels stopped the Pack’s undefeated season. The Wolfpack played more than a couple of close games during their streak. 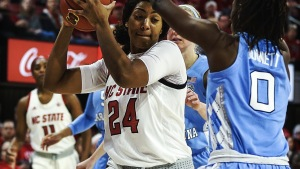 On Jan. 20 against Virginia Tech, the Wolfpack won 70-61 in overtime. N.C. State trailed in the fourth quarter before beating Clemson 54-51. The Wolfpack also survived a 68-60 win over Georgia Tech. Earlier this season on Nov. 22 against Michigan State, the Wolfpack won its second closest game 78-74. The next day at the Cancun Challenge they handled George Washington, winning 69-61. Michigan gave the squad a test at the Big Ten/ACC Challenge, but N.C. State pulled through with a 66-55 victory. The road to 21-0 was certainly not easy. Unfortunately for N.C. State, the injury bug has bitten them. In their game against Duke on Jan. 3, Grace Hunter, the team’s leading scorer, tore her ACL, resulting in season-ending surgery. Hunter, a starter, is a redshirt junior who transferred from Charlotte after the 2016-17 season. She was averaging 14.6 points and 6.9 rebounds per game at the time of her injury. Armani Hawkins tore her ACL one week later in N.C. State’s win over Pittsburgh. In 13 games, Hawkins tallied 54 points, eight assists and 12 rebounds. 15 of the Wolfpack’s 21 straight wins were won by double digits. 960 is the total amount of rebounds N.C. State has accumulated through 22 games. 31.6 is the number of defensive rebounds the squad is averaging per game, which places it third in the nation. 18.4 is the average scoring margin the Wolfpack have beaten their opponents by. Although the Wolfpack look solid, a tough ACC conference schedule is ahead of them. North Carolina proved that the Wolfpack aren’t invincible, but the Tar Heels won’t be the only team to challenge N.C. State this year. There are four ACC teams in the current top 12, including N.C. State. Hearts could be broken again near Valentine’s Day. On Feb. 13, N.C. State will have to face Syracuse at the Carrier Dome. The Orange are currently ranked No. 12. After that, the Wolfpack’s next toughest game will be against defending national champion Notre Dame at the annual Play4Kay game on Feb. 18. N.C. State will have home court advantage that game, but Notre Dame has looked impressive this season. Last but not least, N.C. State will face No. 3 Louisville on Feb. 28 before the ACC tournament at the beginning of March. The Wolfpack so far this season have proven they could go far in the NCAA tournament, even with their loss, yet they will have to bounce back after dropping to North Carolina if they want to chase a title. The journey to a 21-0 start to the season was impressive for N.C. State, but the undefeated season ultimately came to an end at the hands of an in-state rival. The Wolfpack still sit in a comfortable position as we head into March, but they can no longer chase an undefeated record.